Quite a large number of Mozambicans who worked clandestinely in the cities for FRELIMO during the armed struggle were captured and spent time in Portuguese colonial prisons such as Machava in Lourenço Marques or on Ibo Island in the north. After independence FRELIMO did not fully trust these ex-political prisoners (presos políticos), and in 1978 called them to a series of meetings in March, and then again in May. Afterwards, many were required to attend political training and were assigned to specific employment positions where they could be kept under surveillance. There is some discussion of the situation of these former prisoners in Harry West's article "Voices twice silenced: betrayal and mourning at colonialism's end in Mozambique," Anthropological Theory vol.30 no.3 (2003), pages 343-365, (available here, subscription required), and also, in more detail, in Amélia Neves de Souto, "Memory and identity in the history of FRELIMO: some research themes," Kronos, no.39, November 2013, pages 280-296 available for download here. The preference given to a fighter, to somebody who was in the liberation struggle, is not so much for having participated in the struggle but rather because of the fact that through living this experience he or she has taken on certain principles and values, for example the fight against racism, the struggle against exploitation, the situation of women, and others, while you, who were prisoners of PIDE, did not take these on. The armed struggle was a school. It wasn’t just about shooting. It was a political and military struggle. With regard to those who took part in the armed struggle, we know who’s who, they have given us guarantees that what we are busy building after independence will be supported by them. As for you, you didn’t graduate from that school, so equivalency can’t be just handed out like that, automatically. Ex-presos políticos situarem-se no presente: do engajamento à traição. In: Tempo [Maputo], no.406, 16 July 1978, pages 20-24. Click here to view or download a PDF file, size 1.5 Mb. Above: Samora Machel speaking at one of the sessions with the former political prisoners. 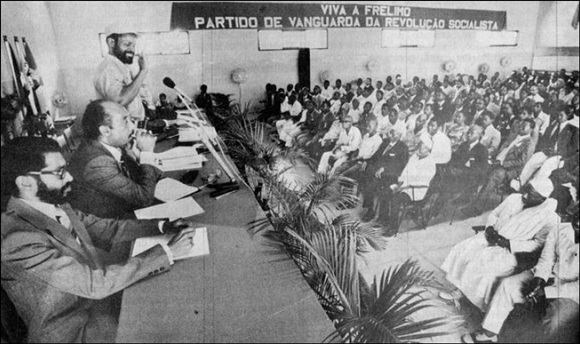 Seated next to him are, from left to right, Jorge Rebelo, Marcelino dos Santos, and, standing, Samora himself. Ex-presos políticos: três tipos de comportamento. In: Tempo [Maputo], no.407, 23 July 1978, pages 27-32. The three types were: Os que vacilaram; os que trairam; and os heróis. Click here to view or download a PDF file, size 1.7 Mb. Os antigos presos políticose o processo revolucionário. In: Voz da Revolução [Maputo], no.60, August 1978, pages 12-13, 20. Click here to view or download a PDF file, size 376 kb. This page was posted on Sunday 23 October 2016.